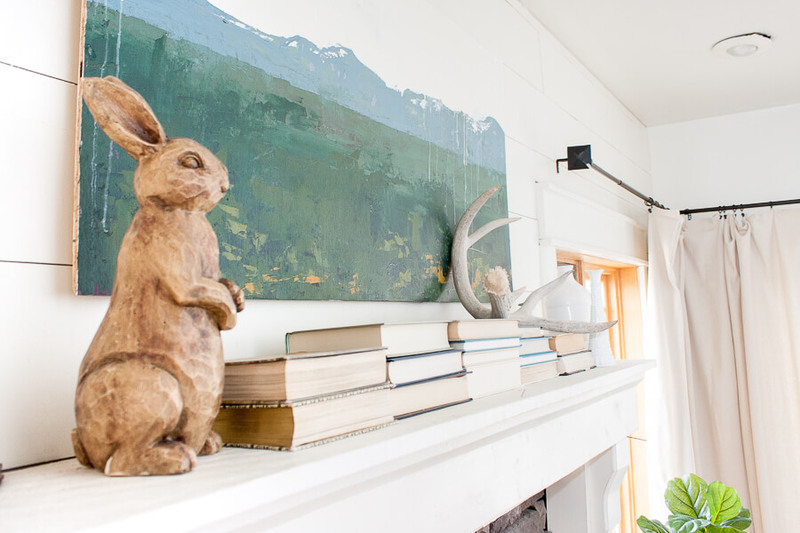 Have you wanted to incorporate artwork into your home but just didn’t know the best way? 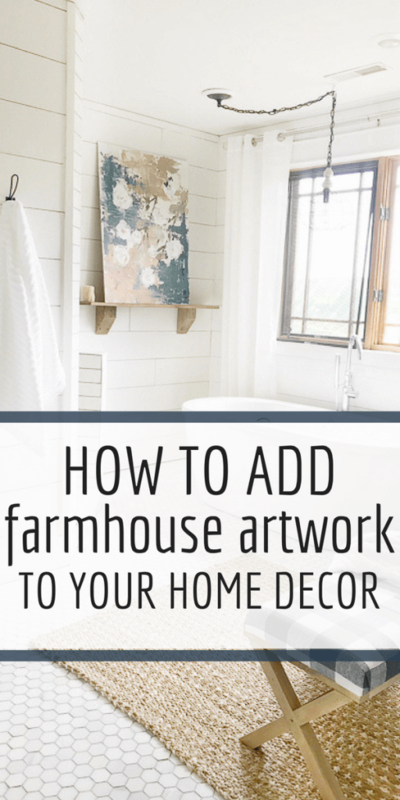 Well, check out my farmhouse artwork and tips on how I decorate with it in my home. If you’ve been here before, then you know. But if not, let me give you a bit of an introduction. 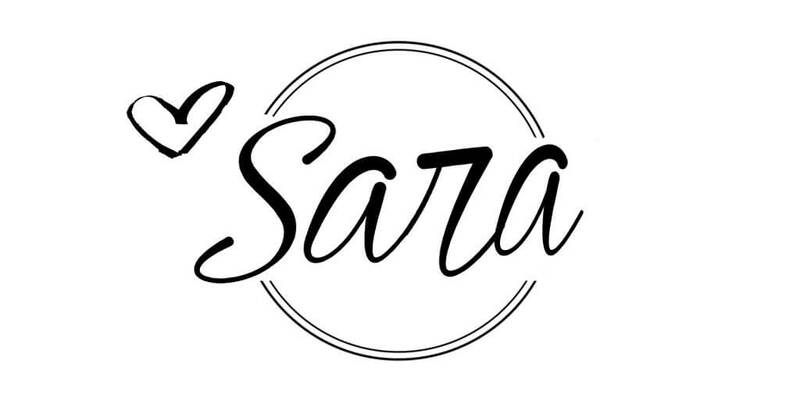 I am Sara. I am a blogger, a mother, a wife, an avid DIYer and an Artist. 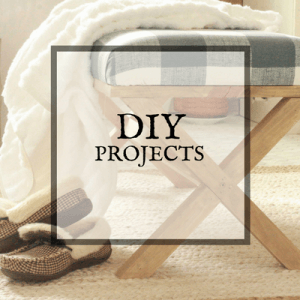 I spent the past 3 years blogging all about DIY and home decor. 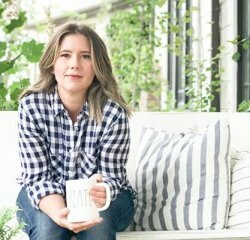 I have been a huge fan of the farmhouse style, and have incorporated some of that charm into my home. I have also been rediscovering my roots. Years ago, before I had children, I was an artist. I painted, drew, and created pottery(this was my most favorite, but the hardest to keep up) As I had children, my free time became less and less resulting in less time for creativity and expression. Before I knew it, I had taken quite a long break, and was really missing my creative side. 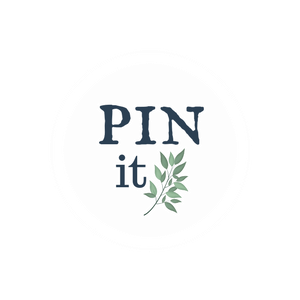 As my children got older, I was able to spend a bit more time working on projects, and soon, this blog became my creative outlet, and now I am back creating artwork, along with other home decor and DIY ideas for my readers. Over the past year I have had many people ask if I would sell my artwork, and after a lot of work, I have begun to create a portfolio of my work and created a new website with prints of my most popular paintings available for purchase, To say I have come a long way is an understatement for sure. 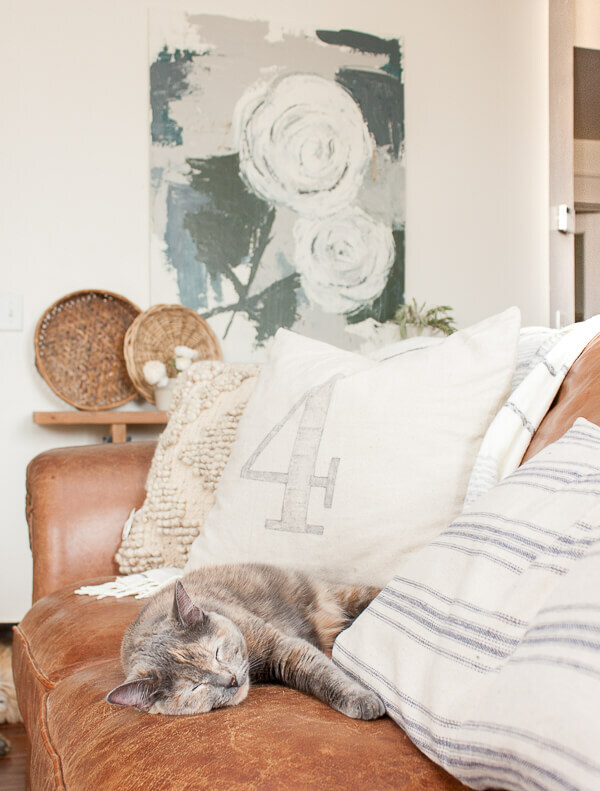 So today I wanted to talk about how to incorporate artwork into your home. 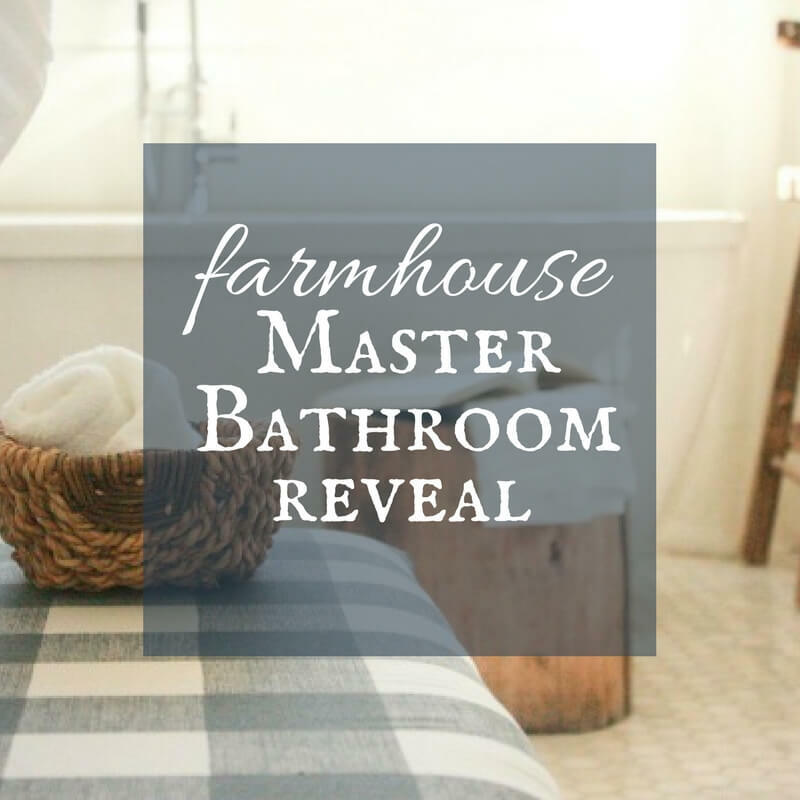 Now, I have been trying to classify what kind of artwork I create and one word that has stuck is farmhouse. I love to use an abstract approach to my paintings. I also love to use a pallet knife when painting my artwork. I work in primarily acrylic paints, and keep a very calming color pallet. One thing I love to do is to paint large paintings. I love the free flow look and the freedom I get when creating a large painting. My brush strokes can be more expressive and there is more movement in them. 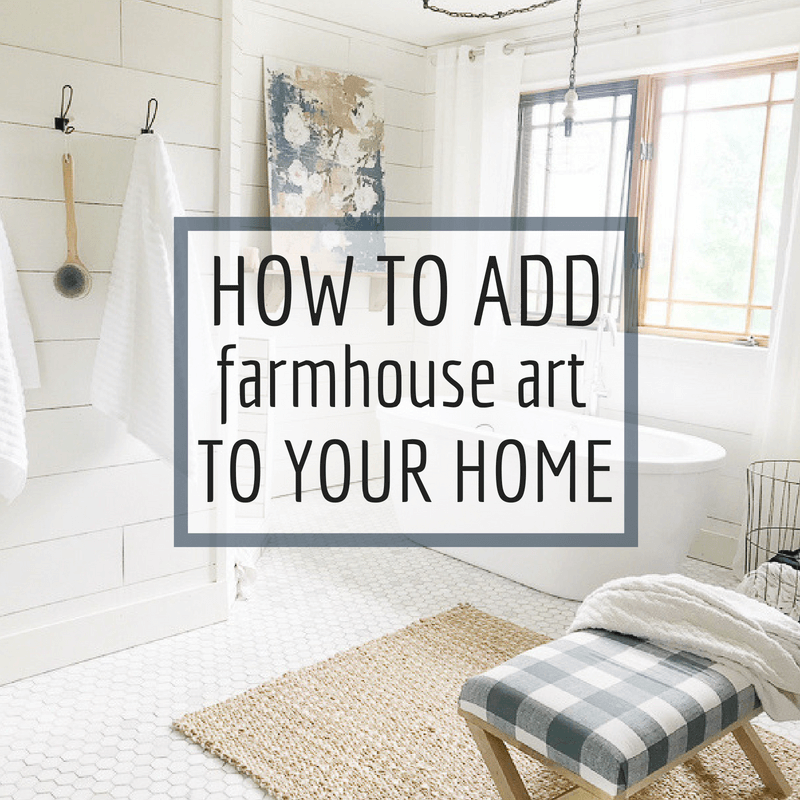 So, since I am now categorizing my artwork as farmhouse artwork, I do want to clarify that it is not only good for a farmhouse style home. I feel that my artwork can transcend many different home styles and would fit in with most decor types. Large scale artwork is a very popular in homes today. If you are wanting to install a large scale piece of artwork into your home, there are a few things to keep in mind. 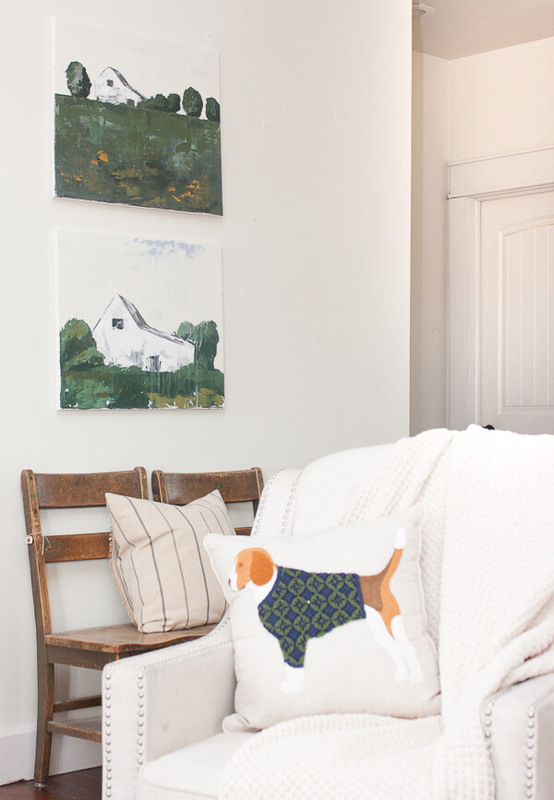 Let your farmhouse artwork be the focal point. You do not need to add anything extra to the space in order to create a dramatic look. When I use a large scale piece of artwork, I like to let it do all the talking. This large floral painting becomes the focal point on this wall. I love the colors that I used in this farmhouse painting. Now speaking of colors, how do you decide what painting you want in your home. 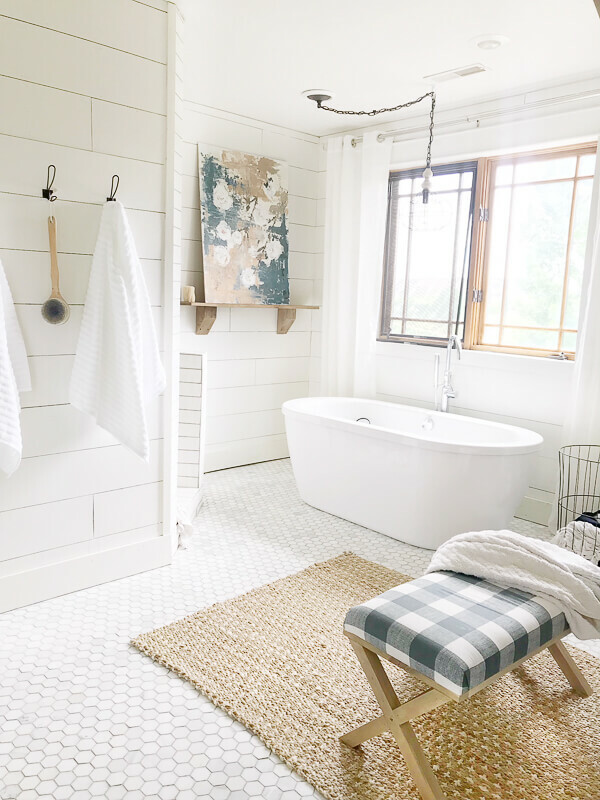 I would say if you are a traditional farmhouse lover and your home dictates that style, then you can be more free with the color you choose. 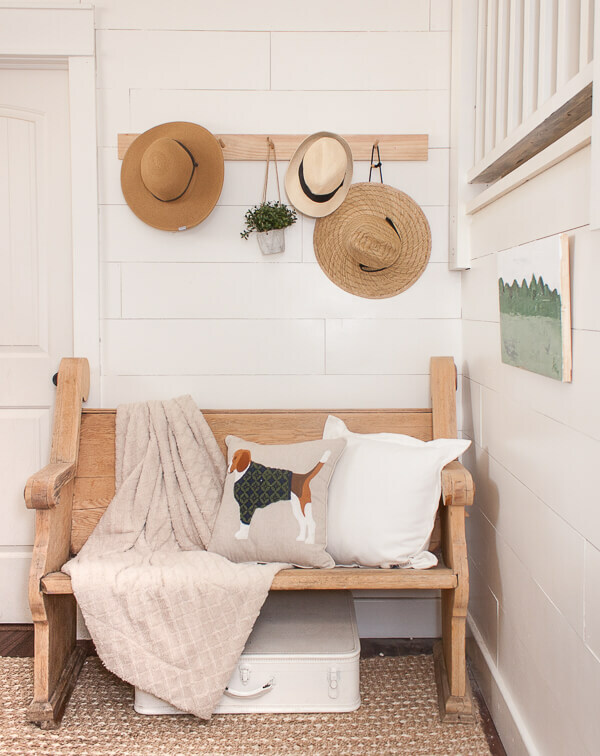 Farmhouse artwork tends to lean more into neutral and soothing color schemes. My home is mainly neutral, with some pops of blue and soft green. 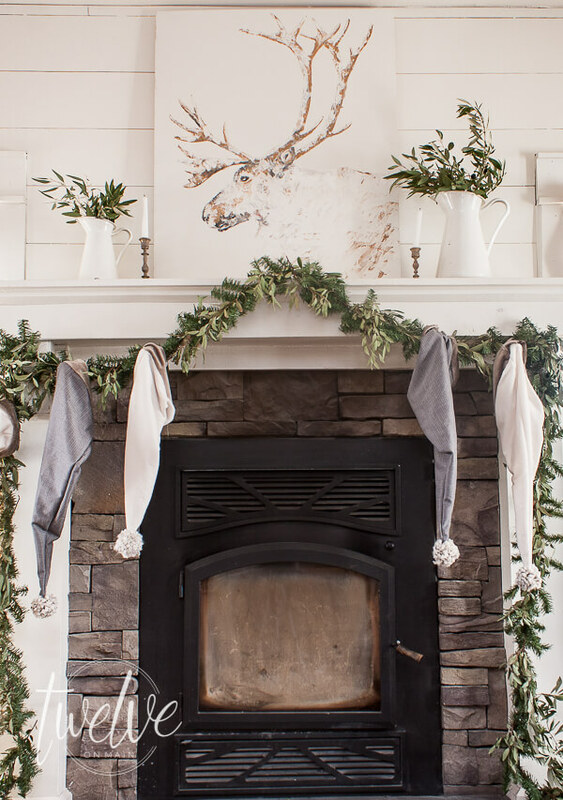 So, when I consider adding a piece of farmhouse artwork into my home, I try to focus on one main color as the focal point and color scheme for that room. That does not mean that you can only use that color, but it is an easy way to direct your decor. I also really love using smaller pieces of artwork in my home. Some of my smaller pieces, such as a 12 by 12 piece looks really great on a shelf, or in a vignette. 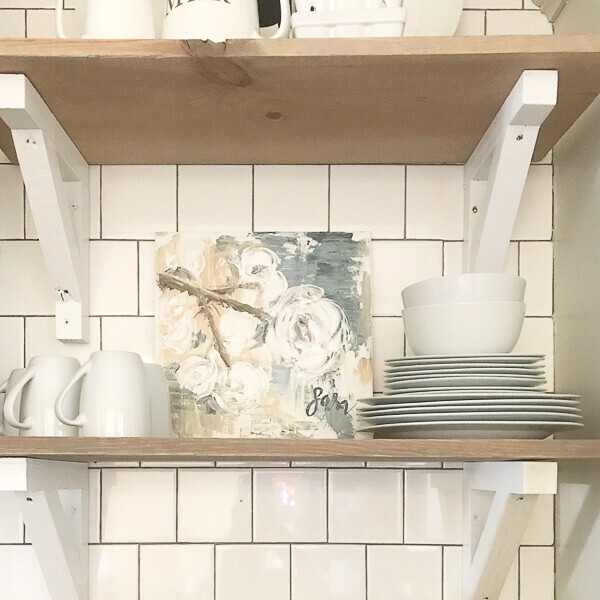 I added a few of my smaller paintings to my kitchen shelves. I used a soft pallet for these abstract floral paintings. I love the movement and dramatic brush strokes that you can achieve when painting a flower. It is a simple subject, but it can be very powerful. Small paintings can also be a very strong focal point if that is what your goal is. I have seen many use a simple painting, maybe one with dramatic colors or a specific mood that gives it all the strength it needs to stand alone. Another way to create an interesting space is by grouping 2-3 paintings together. I have done this a few times. I actually painted a collection that works well together as a set. You can see them below in my family room. These are both available for purchase through my art store. These paintings were inspired by our summer vacation last year. We spent 2 weeks traveling through Illinois, Ohio, Pennsylvania, New York,, Canada. and Michigan. It was amazing to see the landscape with green fields as far as the eye could see, dotted with white farmhouses. It was a simple landscape, but oh so beautiful. What is great about these paintings is that they are more vibrant in color but they also can be versatile in a homes decor. Picking a piece of artwork for your home can be a very personal choice. The painting has to speak to you in some way. Afterall, you are the one that has to look at it and enjoy it on a daily basis. 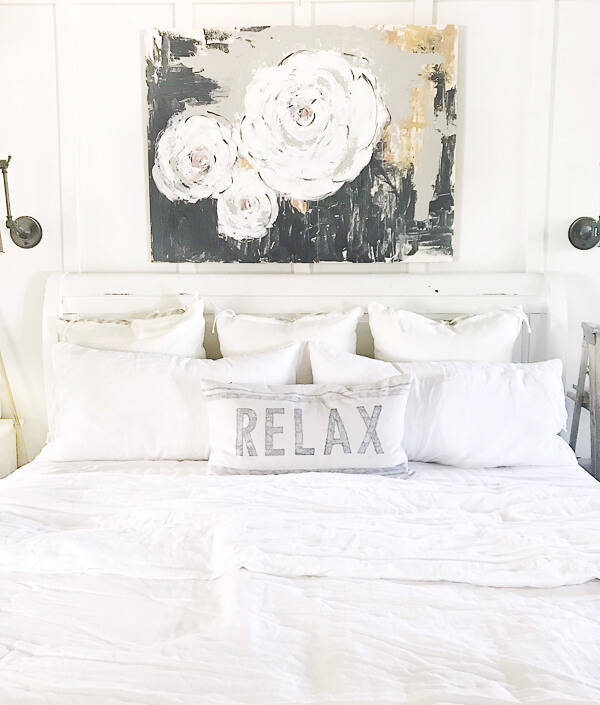 If you are merely looking for something that will look pretty in your home, that is okay too! Nobody can make rules for how and what you choose to hang in your home. I do hope, however that you find something of mine that you would like to have in your home. This is definitely something you will want to take into consideration when purchasing artwork. Original pieces of artwork are much more expensive, but are usually more valuable as well. It is a larger investment to get yourself an original piece of artwork, and if you are on a more strict budget, a print is definitely the way to go! I do have original pieces of art for sale, but I offer prints of each of my original paintings. Keep in mind that some artists may sell an unlimited amount of prints, which can devalue the artwork. I only offer a limited number of prints for each piece of artwork. This prevents my pieces of art becoming too diluted. This also means that there is a limited number of prints available. This may be something you haven’t thought about doing, but I highly recommend trying it out. I change mine out seasonally, and this has mainly been possible because I created all my own artwork. In the fall, choosing a painting with muted autumn tones can transform your space for fall. In the winter, I add this reindeer painting(which is available at my store). You can see how I incorporated it here. In the spring, I changed things up and added my View from the Highway painting, which is full of greens. I also added a second painting from the series in my entryway. A great place to find emerging artists as well as popular ones would be on Instagram. I post consistently about my artwork on my page as well as my stories. I often offer a discount for my followers so if you are interested in getting exclusive discounts, make sure to follow me on Instagram, as well as sign up for my email newsletter, where I offer discounts as well. I have created a place to shop for my artwork right here on my blog. Just click on the ARTWORK FOR SALE in the menu above. You will see all the different categories I have. You can also check out all my farmhouse artwork HERE which is my full art shop website. In addition to my farmhouse artwork and prints, I also have some stylish accessories also available for purchase. These items include weekender totes, cellphone cases, and notebooks. 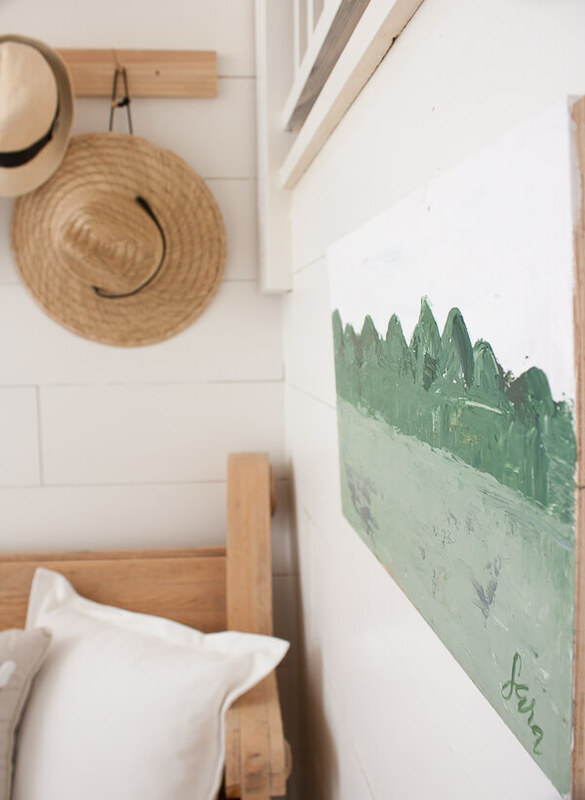 Incorporating artwork into your home does not have to be difficult. But, choosing the right piece can give you years of happiness. What kind of art speaks to you? Maybe you should try farmhouse artwork out. 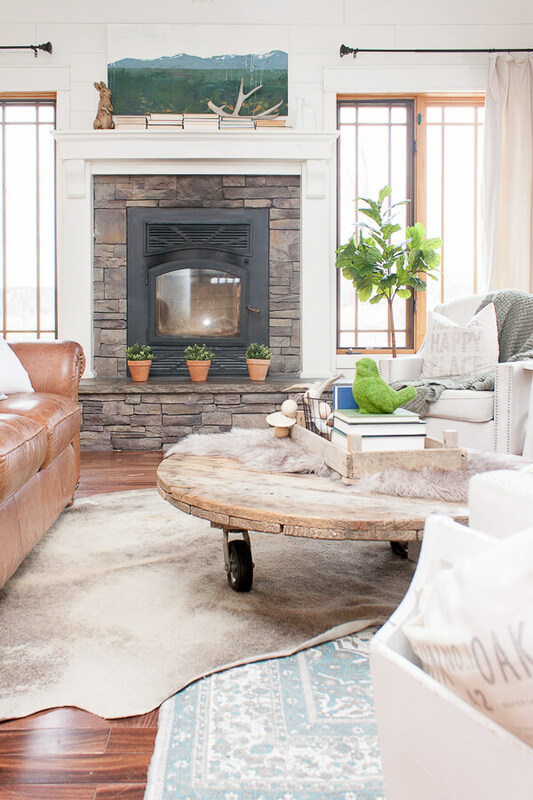 It can be a great way to add sense of serenity and calm to a space while also adding a conversation piece. 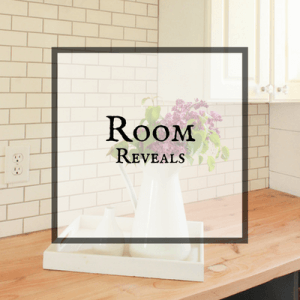 Hopefully this post will inspire you to add some artwork to your home. I know its my favorite way to decorate a space. NOW MAKE SURE YOU SAVE THIS FOR LATER, OR SHARE IT WITH YOUR FRIENDS! Join a community of over 10,000 and get simple design tips, tricks, and with my weekly newsletter. You will also gain exclusive access to my Printable Library!! Success! Now check your email to confirm your subscription. 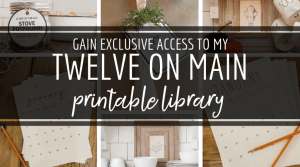 As a bonus, I will be sending you exclusive access to my FREE printable library! You will receive a separate email shortly. « DIY Butcher Block Countertop from Old Trashed Lumber!